Pinnacle Yachts is pleased to offer group events using our fleet of 37 to 45 foot Jeanneau sailboats and Sea Ray powerboats with USCG licensed Captains. A wonderfully unique way to build teamwork, express thanks, and create special moments for coworkers, business associates, family and friends. Extraordinary things happen when co-workers come together in pursuit of maximum performance. Pinnacle’s Corporate Yacht Racing program builds leadership, teamwork and communication skills that translate directly into the workplace. Aboard our magnificent fleet of Jeanneau 37 to 45 foot yachts, your Company’s teams (up to six people per vessel) race along Chicago’s fabulous lakefront under the guidance of a licensed Captain. As a team, the crew faces many challenges related to race strategy and execution. Each team member rotates through the crew positions of helmsman, mainsail trimmer, jib sail trimmers and tactician. The competitive situation and interdependencies between team members performing unfamiliar tasks quickly cause the personal traits of each member to emerge. Team culture evolves and performance improves as the crew learns to better communicate and coordinate efforts. Crew members come to know much about themselves, and how their actions (or inactions) affect others on the team. Regardless of outcome, everyone has a great time. No other team building venue offers the sense of challenge and immediate awareness of cause and effect like yacht racing. This wonderful high-impact event will be talked about at your company for years to come. Pre and post-race activities are conducted at the renowned Chicago Yacht Club and Columbia Yacht Club, both located in Chicago’s Monroe Harbor. Steeped in tradition with remarkable displays of nautical trophy’s and artifacts, these facilities set the tenor for your unique and memorable event. The race course is established approximately 3-5 miles off-shore, east of Navy Pier and the Chicago Lighthouse. Chicago’s skyline serves as a stunning backdrop for the race. The Pinnacle Fleet shines as the newest and largest in the continental United States for use in programs of this kind. A selection from the fleet of twenty late-model 37 – 45 foot yachts – crafted by Jeanneau, the acclaimed international yacht builder – are used for the race program. Each yacht is equipped and finished to the highest standards, with sleek hulls and topsides, richly appointed teak interiors, and advanced rigging and instrumentation. All carry furling mainsails and jibs, full wind instrumentation, and safety gear that exceeds USCG requirements. They are performance-cruising yachts, sailing at about seven knots in a good breeze. The event begins with opening comments by the company’s Sponsor. The Pinnacle Fleet Commander then provides an overview of the day’s agenda and objectives. The race course is reviewed. Team assignments are announced and the licensed USCG Captains (e.g., team Coaches) for each yacht are introduced. Brunch is served concurrently (the menu to be selected by the company). Teams head to their yachts. An overview of yacht operation is provided by the Coach. Crew rotation is established. Safety procedures are discussed. Group photos are taken of the crew on their yacht. Yachts depart Monroe Harbor. Hands-on instruction is provided by the Coach for crew members at each position. Coordinated tacking is practiced. Race course strategies are discussed. Yachts converge to the race start area and jockey for best position at the gun. Adrenaline fills the air as the race start is anticipated. The race commences, and the yachts round marks on six reaching legs. Photos are taken of the yachts and their crews as they race. The fleet returns to the Yacht Club. The company Sponsor awards the winning crew with the coveted Pinnacle Cup trophy that bears the companies name and race date. Photos are taken. Departing comments are made and the event is adjourned. Pricing for this event is $295 per person, plus 9% city tax. This price includes use of new, well equipped Jeanneau yachts, instruction services, insurance, licensed USCG Captain fees, materials, tender passes, race committee boat and officials, photography and the trophy cup. Brunch and room charges are in addition and depend on the size of the group and the menu selected. The race program requires at least three people per yacht, and not less than two yachts. Maximum race capacity is six people per yacht (in addition to the Captain). Up to fourteen yachts can be provided. The race program is offered only on weekdays. Availability is very limited and reservations are required well in advance. Reunite with friends, celebrate a birthday or anniversary, or propose marriage. Chicago’s magnificent lakefront, Pinnacle’s splendid yachts and courteous USCG licensed Captains provide the perfect environment for your special moments. Private Champaign Cruises are offered on weekday evenings aboard our fleet of 37 to 45 foot Jeanneau sailboats and Sea Ray powerboats. Each yacht is equipped and finished to the highest standards, with sleek hulls and topsides, richly appointed interiors below. All vessels carry advanced rigging full instrumentation and safety gear that exceeds USCG requirements. They are performance-cruising yachts, certain to provide an unmatched, luxurious evening for you and your guests. Your personal yacht is boarded at 7:30 PM and returns by 10:30 PM. Underway you witness the wonderful transformation of Chicago’s lakefront as the sun sets and the city lights emerge. On Wednesday evenings, fireworks launched from Navy Pier can be seen from your yacht with the magnificent Chicago skyline as a backdrop. You are welcome to bring food and drink, or the event may be catered as you wish. One fellow took his unknowing parents, future in-law parents, and bride to be for a sail to view Chicago’s lakefront fireworks on a Pinnacle yacht. At the peak of the spectacular show – the sky lit with brilliant colors and echoing with heart-throbbing sound – he took her to the bow of the boat. He extracted from his pocket a beautiful diamond ring that reflected the colors of the fireworks in its cuts, making its appearance extraordinary. He had cleverly attached it to a small floating key ring so that it would not be lost at sea in their exuberance! He gave her the ring and proposed marriage. She accepted. He placed the ring on her finger and gently removed the flotation device. A long kiss ensued with the fireworks still exploding. Their parents watched from the cockpit. All had a wonderful celebration on the yacht afterward. Today, we are pleased to report that this couple now has their first child. Pricing for the evening start at $600 for up to six people, plus 9% city tax. This price includes use of a new, well equipped sailing or power yacht, insurance, licensed USCG Captain fees, fuel and photography. Catering charges and entertainment (if any) are in addition and depend on the size of the group and the menu selected. Captains do not serve food or drink. The program is available on any weekday evenings except Fridays. 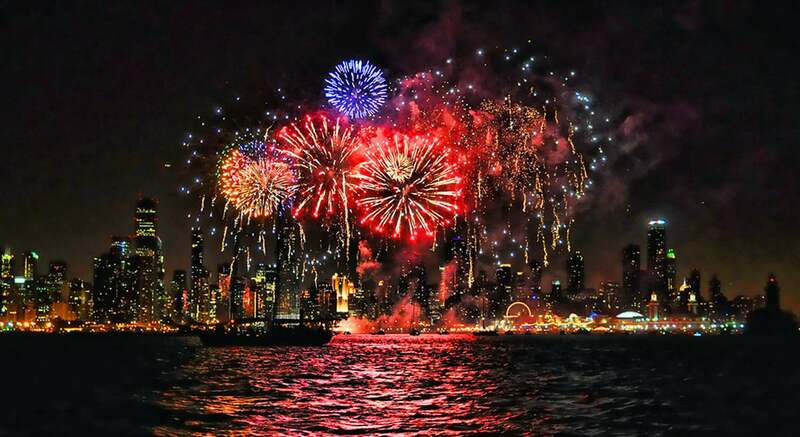 Fireworks are displayed from Navy Pier on Wednesday evenings only. Reservations are required.